Sardinia is wild and beautiful, untouched in many ways, and starkly different from mainland Italy. Its rugged cliffs, powerful sea, and vacillating skies beg to be explored and challenge even the most experienced adventure seekers. Traveling from Oregon, we're never too concerned about tough hikes or warnings, we've braved the elements and summited peaks. We are the first to jump into freezing cold rivers and lakes. Our waterfalls are sometimes frozen, our road trips are windy, and our thirst for adventure is high. So when we plan trips abroad, it's always with the mindset that we're prepared for whatever comes our way. Sardinia was no exception. If you're planning a trip to Italy's forgotten isle, be sure to bring a sense of adventure and make sure these four things are on your list. Just north of Alghero in Porto Conte, you'll discover what some lucky local fisherman first discovered in the 18th century: a marine cave dripping with stalactites and stalagmites. Maybe dripping isn't the right word, since technically the cave is in a dormant stage, but you'd never know it upon stepping inside. But first, the descent is an awe-inspiring journey in itself. Since 1954, 656 stairs wrap tightly around Capo Caccia's cliffside, taking tourists down, down, down to the wide open mouth of the cave. For those less athletically inclined, the grotto is also accessible via boat, departing from Alghero hourly in peak season. Whichever route you choose, the ocean sparkles and seems to go on forever. We took the stairs and each turn provided a view more mesmerizing than the last. The climb down is so visually stunning, that you might forget that you'll eventually need to climb up these 656 stairs on your way back. It feels almost as if you've already seen what you came to see until you take those last few steps and enter the mouth of Neptune's Grotto. A guided tour is the best way to experience the inside of the cave, which spreads out across several chambers and levels. Each space is dramatically lit and natural pools of water create reflections that left us completely in awe. We found ourselves lowering our voices in reverence as we admired nature's elaborate beauty. Stalactite and stalagmite columns created cathedral-like formations soaring overhead like a miniature version of Gaudi's Segrada Familia. The formations bordered a 120-meter saltwater lake once home to Mediterranean monk seal, now extinct in the area. Named for the Roman god of the sea, Neptune, the entire cave kingdom stretches four kilometers, but public access is confined to a handful of chambers. Scientist continue to study the rest. The grotto is about a meter above sea level and can only be accessed when waters are low. Just beneath the surface, underwater marine caves including the famous Nereo Cave delight scuba divers from around the world. If you only have time for one excursion on Sardinia, let it be this. 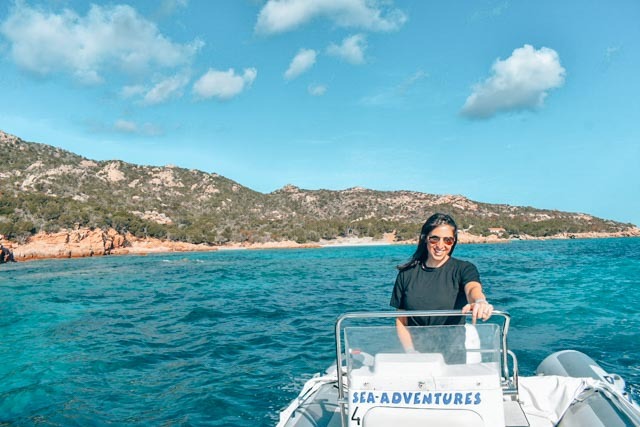 Sailing around the archipelago of La Maddalena was easily our best day in Sardinia, and ranks up there among the very best days of our trip to the Mediterranean (which spanned three countries in three weeks). Maybe it was the ease of renting a boat with the only caveat to bring it back by sunset, or maybe it was the feeling of being out on the open sea, whatever it was, sailing around La Maddalena was one of the best days of my life. For starters, it's very easy to rent a boat on La Maddalena. If you're staying in a hotel, the concierge can phone a vendor to meet you at the port with everything you need for a day out at sea. During peak season, I imagine the vendors are stationed at the port for even easier access. We walked down to the port and met the vendor who got us outfitted with a motor boat and a laminated, illustrated map of the archipelago. He suggested we stay to the west and north of La Maddalena, too far east and we'd face some harsh winds and serious currents. He asked that we return by sunset and with that, we were off. Our first stop was Spaggia Punta Rossa Corsara on Isola Spargi - a beach on what felt like our own private island in the middle of the Mediterranean. We took our time here, splashing in the water, basking in the warm sun, and snapping photos. We snacked on nuts, fruit, and cheese we'd picked up at the grocery store that morning. We continued around the southern tip of Isola Spargi, passing Spiaggia di Cala Corsara and navigating through boulders that protruded out from the sea in surrealist formations. They’d been smoothed and shaped by the elements: water, wind, sand, and sea. The water was crystal clear and perfect for snorkeling so we stopped here and took another dip. I was on a mission to find Spaggia Rosa, Sardinia's famous pink beach, which was on Isola Budelli due north of Isola Spargi. We made our way there only to be disappointed by what we'd found. The beach was completely cordoned off, with a string of bright orange buoys blocking boat access along with a warning sign not to enter. We were close enough to see the sand, but all of its magnificent pink was gone. As it turns out, what was once aptly named Spaggio Rosa for its flushed hue is pink no longer. The color was the result of a unique set of minerals which caused the sand to take on the rosy hue. Tourists flocked to the beach and too many took home a souvenir of pink sand. Before long, all of the pink sand was gone. Currently, the beach is closed off to tourists. Efforts are being made to preserve the area and bring back the pink sand. We spent the rest of the day exploring the small islands that dotted the archipelago of La Maddalena and lounging on white sand beaches. As the sun inched closer to the horizon, it was time to head back to the main island. We bid farewell to our picture perfect day. In case you’re still a bit confused about Sardinia, it’s an island smack dab in the center of the Mediterranean belonging to Italy, but decidedly independent and, for better or worse, isolated from the mainland. Corsica, which is claimed by France, is the closest landmass, and to make things more complicated, many of the locals are of Catalonian descent. There are many ways to experience the Island, much of which is navigatable via highways and roads that cut through coastal cliffs and picturesque pastures. We rented a camper van from Cool Campers, an Alghero-based, family-owned rental company specializing in refurbished, vintage camper vans. Let’s just say what she lacked in speed, she made up for in character. A paper map was a necessity given spotty WiFi throughout the Island, and after a little planning, we were out in the open road. Driving up and down the coastline and clear across the island’s pastoral midsection, we were able to experience Sardinia less as tourists and more as adventurers. We stopped along the way for espresso, meals, hikes, and to take in stunning vistas. The towns varied from quaint (think Bosa), to bustling (think Nuoro), and the views along the Emerald Coast took our breath away as we hugged the highways that curved along its edges. 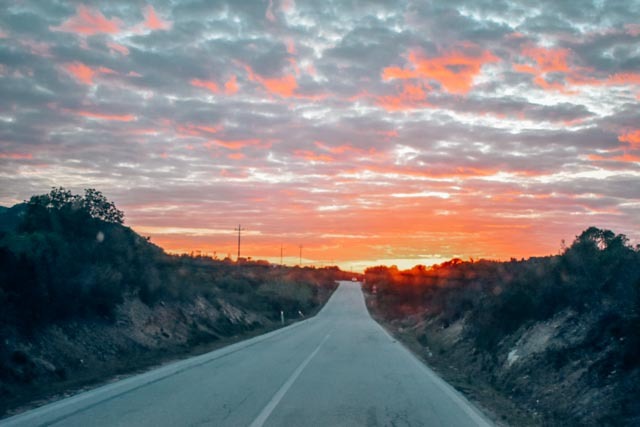 We witnessed some incredible sunsets, one from a rooftop in Old Town Alghero, another along the highway west of Bosa, and probably our favorite, which we nearly missed, at Isola Rossa, a town renowned for its craggy red rocks and picturesque port. Just east of La Maddalena, connected by a narrow causeway, lies its rugged counterpart, Caprera. Perhaps what La Maddalena looked like before it was ever inhabited, Caprera is home to wild beaches, majestic animals, and challenging trail systems. The island is a nature reserve for birds as well. The first trail we hiked was Monte Tejalone, which we later learned was the highest point on the island. Along the steep climb, we marveled at wild mountain goats hanging out cliffside. In fact, these goats are probably the reason the island is called Caprera, capra means goat in Italian. Once at the top, we soaked up views clear across La Maddalena, and even down the Emerald Coast, which we'd explored the day before. Just around the back side of the summit, we spotted a beach below and told ourselves we needed to make it to that spot. We made our way down the mountain and back to our camper van. Unfortunately, we didn't choose the best parking spot, and for the next hour, struggled to get the van unstuck. Finally, two French tourists and an Italian cyclist came to our rescue, helping us pull the van out of the ditch we'd created from our efforts. While some may throw in the towel after getting stuck, the lure of that secluded beach was enough to convince us to go on one more adventure. The path to the beach proved tricky. So tricky that a volunteer was stationed there warning travelers of the hike ahead. It was a 45-minute hike to Cala Coticcio beach. The rugged trail featured slippery, muddy paths, jagged rocky climbs, and a six foot drop, but eventually we made it to what's been affectionately called Tahiti Beach. So while the pink beach might have eluded us, we still got to experience some of the best things to do in Sardinia: scenic drives, balmy beaches, and a day at sea to name a few. If you have an adventurous spirit, Sardinia might be high on your list too. And if so, plan to visit Neptune's Grotto, spend a couple of days on La Maddalena and out at sea, and plan a few hikes over on Caprera.